The Twelve Labors of Hercules were a series of tasks of penance performed by the Greek hero Hercules. In Loading Dock Theatre's fascinating production, The Twelfth Labor, the Twelve Labors of Hercules, among an abundance of other things, inspire a family drama, like no other, set in the Midwest in the 1940s. Written by Leegrid Stevens, The Twelfth Labor is told through the eyes and head of mentally handicapped Cleo as we watch her mother Esther as she attempts to keep her family together despite the hardships of life. With a fascinating mix of epic realism and stylized dreams, The Twelfth Labor is a family drama at its heart tackling some bold themes. Stevens’ daring script touches on some taboo topics presented in a fantastical manner. Broken up into four acts, the play begins with a premonition by Herc, the youngest child, about a man returning home. After the dream ends, the family history, including a bombshell reveal about the nature of Herc's mother, and relationships are explored as we learn about the trials and tribulations of hardship that each member of the family is forced to endure. The scripted second act is intriguing as it takes place through Cleo’s memories with the language spoken directly to how Cleo hears it. Stevens does a phenomenal job creating an accessible language and word with this second act, allowing us to truly get inside Cleo’s head. The staged first act is captivating, keeping the audience glued to their seats eager for answers. However the staged second act falls a bit flat in comparison, living in almost a different theatrical world. The scripted Act III sets Cleo's dream to a movie. While we know she longs to go to the picture show with her sister, we never know much of her love for film therefore the movie device, while entertaining, lacks weight. Through the dream device, we do receive interesting insight to the other characters and their parallels to “The Wizard of Oz” ensemble. By Act IV, which returns to realism, a heavy wind threatens the characters and the farm. By bookending the play with realism, it allows the tale to come full circle. We begin with a premonition and end with the result. While The Twelfth Labor relies on the audiences knowledge of the source inspiration, the play is truly inspired by the writer’s own family. Due to this, it may be the reason why the father figure has such a presence in the second act. In Act III, Forrest appears, breaking the whimsical movie world, and offers a lengthy and poetic monologue about his time as a POW. We spend the majority of the play, waiting for this Godot-like figure, so theatrically, his appearance and monologue are unsatisfying. However if he appeared only at the very end of the play, the pay off would have been well worth the wait. 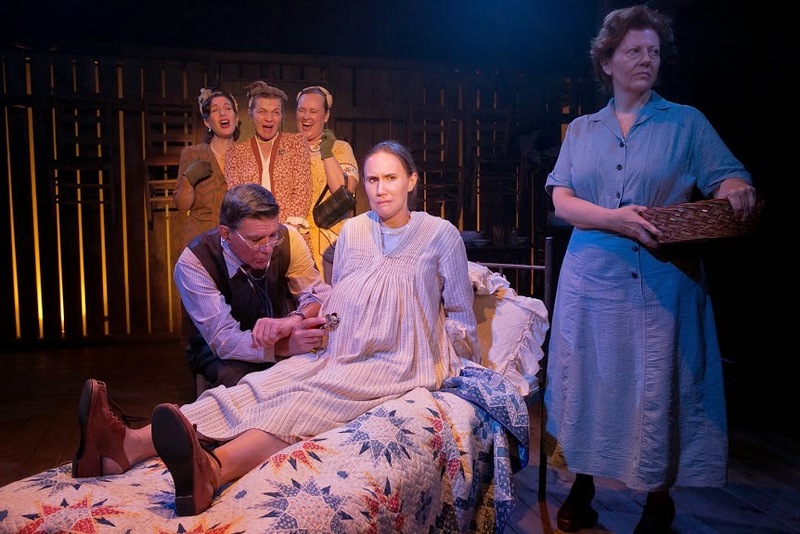 With the family history so prevalent in the piece, it makes sense why the monologue exists but it truly feels as if it should be a part of another play. But as a full, overall piece of theater, Stevens’ script is quite brilliant. The entire ensemble, from the core characters to the Greek chorus of gabby ladies, did a spectacular job in Stevens’ world. As Esther, the manipulative matriarch with good intent, Lynne McCollough offers a breathtaking performance. From resilient to pained and back again, McCollough’s performance is nothing short of a master class. Erin Treadway gives a transformative performance as Cleo. Her chemistry with her family, especially with McCollough’s Esther and Shelby Hightower’s Donna, gives the character and story vivacity. Hightower does quite a striking job as the unscathed youngest daughter Donna. Though the monologue may not fit, Jed Dickson is exquisite sharing his story as Forrest. Director Matt Torney has the ginormous burden of bringing The Twelfth Labor to the stage. Fortunately, he does spectacular work. The creativity and innovations throughout the play kept the piece engaging. Though there were some iffy staging moments in the realistic worlds as the definition of space became muddy. The entire creative team brought a cohesive design to life. Carolyn Mraz’s cabin inspired set combied with the lighting design by Simon Cleveland allowed for some wonderful stage pictures. Though some of the larger wood gaps on the back wall allowed for the architecture of the space to shine through when Cleveland’s backlight was present. The Twelfth Labor is one of the most exciting and revitalizing pieces of theater. With a intelligent script and a brilliant performance by Lynne McCollough, The Twelfth Labor is a piece you need to see to believe.